Attention Cat Lovers! It's time for Weekend Cat Blogging #17! Food Bloggers around the world unite each week and share pictures of our favorite felines. See cute cat photos and discover yummy food blogs. You'll find all the links to this week's entries here at Eat Stuff in Australia (run by the adorable Kiri). We'd love to have you join us. Just send your permalink in a comment to Clare (Kiri's slave) at Eat Stuff and add a "Weekend Cat Blogging" tag to your post. Having experienced henhouses and chickens in general, I'll side with the cats any day. 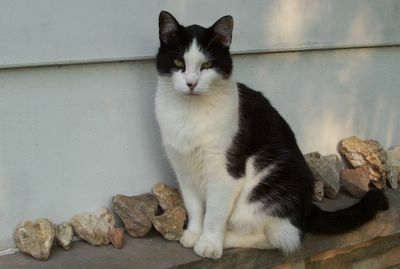 Especially sweet ones like Patches..
Hi FG, nice pose against the wall with rocks behind. Hiya Patchy Cat! Looks like you are taking a well deserved break from farm chores.